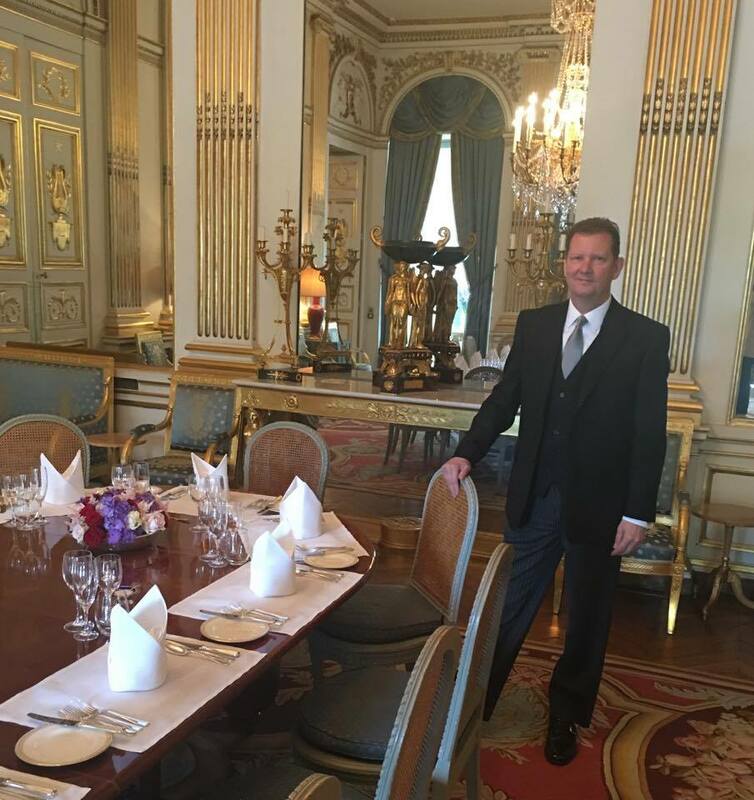 Ben Newick has been the Butler at the British Embassy in Paris since 1984. Could you tell me a little about your life and professional pathway? What led you to pursue a career in hospitality? How long have you been working at the British Embassy in France? At school, I was keen on art and music, but not particularly academic. I decided that I wanted to go to catering college in the hope of eventually securing a job at one of the Royal Households. The college where I studied in Broadstairs, Kent, routinely sends students to Buckingham Palace as extras – they’re paid as young professionals. I enrolled in the college and after a year I was included in a team of students sent to the Palace. Amongst the events we worked on where HM The Queen Mother’s 80th birthday party, a State Dinner for the King of Nepal, and several diplomatic receptions. The irony for me was that, following my college course, I was shortlisted for a full-time position at the Palace, but there were no vacancies at that time. There was however an opening in the Paris Embassy Residence for a Footman, and I was asked if I would be interested – doing a very similar job on a much smaller scale; I say smaller-scale because, as an example, if we look at the set-up at Buckingham Palace, there were fifteen footmen employed there – and there exists a strict hierarchy of footmen, pages, butlers, stewards, in fact 400 staff in total. Here in Paris, there were two Footmen and a Head Butler with about 20 staff at the time. This illustrates the difference in the size of the operation. I arrived in Paris in January 1981 at the age of 18, and enrolled at the Alliance Française to learn French, given I had only the most basic of French (mostly culinary!) , so this was a big learning curve for me. After 2½ years in the job as Footman I decided there was no future in my role so left to work with a former colleague who was Managing Director of a Hotel in Broadway in the Cotswolds. After 6 months there, the wife of the Ambassador, my former boss Sir John Fretwell, wrote offering me the newly-vacated job of Butler. So in January 1984 at the age of 21 I returned to Paris and have now clocked up 33 years’ service as Butler. Is it common for butlers and staff working abroad to remain at a same workplace for this long? It depends on the family/boss that you’re working for, and on your own individual choices. Things evolve in an Embassy and Ambassadors change anywhere between 3 and 5 years. I met my wife in 1987 and we have 2 sons (born in 1991 and 1995). There’s a natural progression with certain matters of diversity in your life, so that the focus for me wasn’t necessarily moving on to something different. For me it became really important to get a good team that worked well together, and with me. At my initiative, we started recruiting people from my former College, now East Kent College. I have now employed twenty five students from the College. In 2001 we started a work-experience programme – each year they would send me students in the summer (our busiest period), to work alongside us for a month. We mentor the students. They shadow us, we train them, and they hopefully enjoy and learn something from the experience. My first work-experience student is now the Butler at the Embassy in Washington. Another student from 2006 is now the Butler at Chatsworth. My immediate team Matthew and Drew have been at the Embassy since 2003 and 2013 respectively. There haven’t been any full-time positions available since then. What does an average day of work at the Residence look like? What are your principal duties? Of course it depends on the day. The Ambassador’s life is very busy and doesn’t always concern us directly, as he spends time outside meeting contacts and the different regions of France. Recently for example we had a dinner for 16 followed by lunch for 24, followed by a British Community Annual General meeting in the evening and a reception for 120. It is my responsibility to take care of the delivery of events but our small team set everything up including staging or any audio/visual needs. There are a core team of four – myself, Matthew, Drew and Guylain, who helps with the events as well as his other duties as heading up the team of housemaids/cleaners. The four of us are front-of-house focused, and for large events I hire in extra staff from our circle of professional contacts. If we don’t have an event on, we focus on administration, silver-cleaning, working on the wine cellar and routine maintenance. The Embassy changed from being purely an Ambassadorial Residence to an events’ venue, meaning one day we might be launching a new Jaguar car for Jaguar Land Rover, putting on a concert, or a commercial or scientific event covering nanotechnology, wind farm energy, nuclear power – a huge range of subjects. 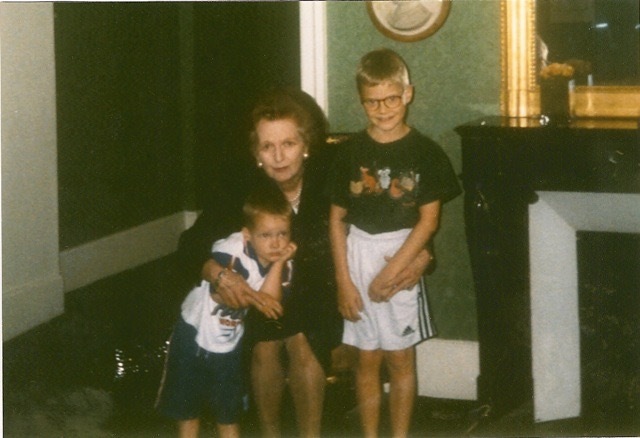 Ben Newick photographed in the Ambassador’s Residence whilst giving Eugenia a guided tour of the premises. What is the best etiquette and protocol training programme today for staff training at Embassy, Consulates, Diplomatic Offices and Ambassadors’ Residences? There are various schools and venues that you can go to learn, which are reasonable starting blocks. However, if someone has the opportunity to start young and in the right household, you don’t necessarily have to go to a specific school. If you have an 18-year old student straight out of college, and you train them the way you want them to be trained, this for me is an excellent start to their career. It’s all to do with experience, and the only way you can become successful is through years of experience. How long does it take to train someone? What areas of expertise have you found to be indispensable? I would say that a couple of years is a good benchmark. Staff I have employed already have a qualification in food and beverage service, or something similar. They can usually already cook and will have served in a restaurant environment. The primary objective is to ensure that their standards are high in every facet of the job, and meet mine! Firstly, is their personal appearance, with uniform clean and pressed, clean and polished shoes – this is key. Other crucial skills are learning how to greet people, how to answer the telephone, how to talk to guests/colleagues and also ensuring discretion in service. One of the things I learned very early on was that when you’re serving a table in a house like this, the secret is to not be noticed. 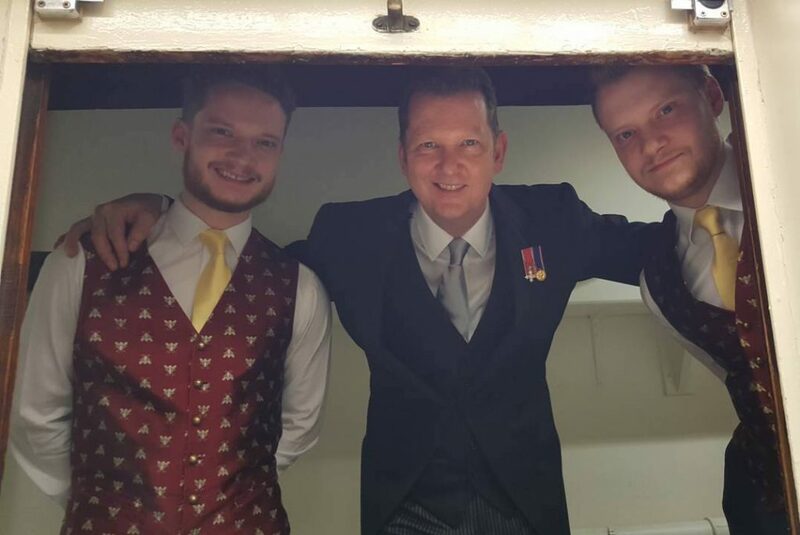 The Footmen need to be on top of a variety of tasks, whether it’s looking after valuable silver or running a wine cellar. They learn how to do these things and how to get the best results. What advice would you give to a young French or Brit looking to pursue a successful hospitality career? What personality and behavioural traits, and skills are needed to excel at your job? I think passion to start with. If you’re going to be a chef or working in a front-of-house role, you have to have a spark of passion about what you do, what you’re serving and who you’re greeting. First and foremost, I am proud to work with the government and members of Royal Family, who stay at the Residence when undertaking official visits. One also needs to be motivated to be willing to take the time to learn, whether it’s the language, about wine or food and drink. Have that passion to learn. For me, personally, working somewhere like this, the historical element is very important for me. I worked here for six or seven years before the history bug started to bite: I wanted to know more about the history of the house, how it has evolved and who lived here. I’m now very confident to give people interesting tours of the house, which I do a lot for either official guests, or the Ambassador’s personal guests – from the sort of Napoleonic era onwards. What’s your favourite historical anecdote? I think there are all sorts of different things to tell. One of my favorite stories dates from 1814. When Napoleon abdicated and went into exile and the Bourbon monarchy was returned from England to the French throne, the British government was looking to purchase and open a new Embassy for its new Ambassador to France, The Duke of Wellington! The property they found most suitable was the Hôtel de Charost (other possibilities were the Élysée Bourbon and the Hôtel de la Marine in the Place de la Concorde). They chose this house as it came fully furnished, purchasing it from Pauline Borghese, Napoleon’s younger sister, who was obliged to sell as she was in exile with her brother. Pauline was paid in installments of Louis d’or (gold Louis coins), which she passed on to Napoleon (who in 1803, had helped her buy the property originally). Soon afterwards in 1815, Napoleon escaped and returned to France and raised and army, starting the hundred days war and the Battle of Waterloo. One could say that this particular war was partly financed through the purchase of the embassy – although this very much tongue-in-cheek, there has to be a small element of truth in this anecdote. How has the Embassy changed since you started working here in 1981? The main change is that this house used to be very much the Ambassador Residence. Ambassadorial representation has changed from having grand dinners for the French aristocracy in the gentile entertaining manner of the day, to having dinners for the movers and shakers of Franco-British industry and the political scene. The Residence is now a really important window for Britain. We put on a huge range of commercial events. We received almost 15 000 people this last year. Large Embassies such as this one have become important venues for events sponsored by large companies. Some of the income generated is reinvested into the property – particularly important is the maintenance of the Residence with its wonderful bronzes, furniture, carpets and so on, as well as technical or equipment for events. That is a big change, as Embassies used to be non-profit. You featured in an article of the BBC in 2014 where the journalist described a guided visit around the British Ambassador’s Residence. The article is titled Scandalous tales from the British Embassy in Paris. Could you provide us with a story or two of your time working at the Embassy? We’ve had some interesting visits. One anecdote which I recall vividly was in the mid 1990’s when Princess Diana was staying. I met her several times. She came on this particular occasion because she was involved charity work for which she was lunch downstairs in the main Salon Bleu. The entrée of Glamorgan sausages was served with a thick tomato sauce. While keeping my usual eye on proceedings, I spotted that the Princess had somehow managed to get the sauce all over her elbow. She was wearing the most amazing woven electric blue silk jacket and hadn’t noticed immediately. We had to take the jacket and give it to her dresser who I think might have had a few tears. It’s funny to think about it now, but at the time I was horrified! There is such a diversity of people that I’ve met over the years. I’d have to stop and think and go through a few diaries to remember all of the things that I’ve done and seen. Most recently of course, the first official visit to France by the Duke and Duchess of Cambridge was a highlight. I have also met the HM The Queen on many occasions (both here and at Windsor Castle), she is truly amazing for her age, putting in such a tremendous amount of work which clearly add to the warm Franco-British relationship. There are certain people that you may miss because you’re not necessarily tuned in to an event and don’t realise how high profile the person that you have talked to or served is. Apart from all the Prime Ministers and government ministers, other notable visitors have been Rudolph Nureyev and Yehudi Menuhin in the 1980s to the Rolling Stones, Rod Stewart, Victoria Beckham, Simon Callow, sporting stars and many others. Do you like the French culture? Absolutely. I think I get the best of both worlds. I think from an early age I always liked the French way of life, certainly the French gastronomy, whether it’s at home or in a restaurant. It is a little bit more special. Britain is now one of the leading countries in the world of food and drink, but I still love the traditional French classic dishes, which can be quite rustic. I like all sorts of things French: wine (my main passion – I’ve visited many vineyards in Bordeaux, Champagne, Burgundy and secured excellent deals for the cellar by cultivating my contacts there), French films, museums, art galleries and of course, le rugby.